A DECENT WOMAN is scheduled for publication in July 2014. At this time, my Booktrope Team and I are heavy into the editing and marketing phases of the book. I am fortunate and blessed to work with such talented folks! This week, I’m finalizing the email to family and friends about joining my Book Launch Team. I’m also putting together a list of local book stores and hope they are open to me coming in to do a book reading. Local in this area means I’m looking at book stores in West Virginia, Virginia, Maryland and possibly, Washington, DC. I’ll be happy to drive an hour or two to do a book reading. But when I think about reading from my book, I get butterflies in my stomach. Not the good kind. I begin worry. Will I ever get to the point where I feel confident that I’ve sent out the best possible version of my book? Lighting another’s candle from the flame of our candle does not diminish our flame in any way. On Saturday, I met 10 awesome authors at the Chocolate and Book Festival in downtown Martinsburg, West Virginia. Half of the authors live in my town which was exciting to learn. I enjoyed visiting with them and with my favorite Queen Street store owners who graciously hosted the authors for the annual event. It was a fun event, the chocolates were amazing and I am excited to join the book festival next year! The authors and I shared information about our books and the issue of butterflies in the stomach during a book launch came up. I realized that my butterflies and I aren’t alone. The consensus was that sending a book out into the world with complete confidence is a goal! Gaining more confidence comes with experience, learning as much as we can about writing and, of course, continuing to read great books by talented authors. I am extremely grateful to authors who share their writing and marketing expertise through classes, workshops, blogs, and books. I am a sponge at this point in my life which seems pretty amazing given that I’m over half a century old 🙂 The authors I met on Saturday very kindly shared what they’ve learned about marketing in this area and offered me several great tips on who to see about printing bookmarks, postcards and banners for my book launch. In June, I will be giving a brief presentation on reviewing books at the Berkeley Springs Book Fest in beautiful Berkeley Springs, West Virginia. I’m looking forward to meeting more local authors on that day! In the middle of all this excitement, my son moves to Europe in a week. His move is never far from my thoughts. This past weekend, I enjoyed a wonderful weekend with my children and family in Northern Virginia, celebrating my son and this happy milestone in his life. It is looking like London will be my son’s new home. Two companies are willing to sponsor him and that’s great news. I only had to excuse myself once from the dinner table. I thought that was pretty damn good. I managed to hold it together and will try to keep it together at the airport next week. I can’t promise, though…a dear friend will accompany me to say goodbye to my son. He will keep me focused on making it back to West Virginia through DC traffic in one piece and has promised to remind me that the future looks great because it sure does. All in all, this will be a busy week for me. I hope you are well where you are! This Friday we will be interviewing Patricia Mann, author of the women’s contemporary fiction novel, IS THIS ALL THERE IS?. I hope you will enjoy this talented writer as much as I do! Please join us. I messed up in the scheduling of Author Interview Friday and now have a huge calendar to keep me organized! So, I’ve decided to answer my own interview questions. I hope you enjoy the interview! A Decent Woman is historical fiction. A Decent Woman is a story of catastrophe and survival, choices and betrayal, the story of the midwife Ana and the women she befriends who find themselves pitted one against the other in male-dominated Puerto Rico at the turn of the century. It is a story of the bonding power of unlikely friendships that carries them through tragedy and betrayal, and the cost of living with dark secrets. When I finished the first draft of the manuscript, I realized that the main themes of the story were decency and indecency. During a conversation with my children about integrity and strength of character, we agreed that most people in the world are decent and have good intentions. We spoke about how decent people are sometimes forced into indecent situations for reasons such as poverty, trauma and catastrophic events. My title was born from that conversation and also from one of the amazing books I used for my research-Imposing Decency by Dr. Eileen J. Findlay Suarez. Her book changed the ending of my story, making it more realistic and historically accurate. I am eternally grateful to Dr. Findlay! My novel began as a very detailed tribute and gift to my maternal grandmother on her 90th birthday. My family and friends loved the tribute and my then-husband encouraged me to write an outline. When he read the outline, he told me I had a book to write. So I did. All of it! I can’t imagine doing anything else and I am blessed to write full time. I love creating new stories that introduce readers to Latina(o) and Caribbean characters, history and perhaps, places that are new to them. When I am writing, the outside world disappears and I enter the internal and external worlds of my characters. There is nothing I enjoy more than writing. Painting is a close second, however. I enjoy both the writing and the editing which most writers dread. The most challenging aspect has been accepting that a story is finished. I have this issue with painting, as well. I tend to worry that the writing or brush stroke can be improved upon. Chapter One of A Decent Woman was rewritten more than times than you can imagine! I’ll probably experience these challenges throughout my writing career as I’m tough on myself. I continue to learn to write better prose with each book I write and with every good book I read. There are so many, but the authors whose books I will buy without hesitation are Barbara Kingsolver, Arundhati Roy, Jack Remick, Chitra Banerjee Divakaruni, Odilia Rivera Santos, Esmeralda Santiago, Gabriel Garcia Marquez and Milan Kundera. The most influential people in my life have been my mother and maternal grandparents, all born in Puerto Rico. I was born on the island and spent every summer with my family in my grandparent’s home in Ponce, our hometown. Before I headed to the US for college, my grandfather told me never to forget where I came from. I took his wise words to heart. I am blessed to have a very close-knit family and in Puerto Rico, even the wife of a very distant cousin is always considered family! In the winter months, I write at my dining room table where I have a great view of my side garden. In the summer, I love to write under the ancient grape arbor that shades my patio and at my weekend get-away on the West Virginia side of the Potomac River. I began building my author platform in 2007 with writing a blog and joining social media sites. Social media is so important to the publishing process and it takes time. Every day, I learn of a new marketing angle or tips for selling books. I am learning to find a balance between keeping up social media and writing. Having an insane passion for the story and characters keeps me moving forward. You have to love your story because you could be reading and editing that manuscript for years! This might sound corny, but early on I visualized myself as a published author. I kept at it, made personal sacrifices and never gave up my dream. If you don’t write a blog, start one today and remember to comment on other’s blogs. Join social media sites and query as many literary agents as you can. The Writer’s Digest was a huge help in locating agents who represented my genre. Devour books on writing and attend writers conferences. Don’t give up, keep writing. I hate the thought of an untold story. Before I fell in love with writing books, I was an exhibiting artist for 20 years and facilitated many creativity groups using Julia Cameron’s seminal book, The Artist’s Way. I’m thrilled to announce that Booktrope has accepted my second novel, Finding Gracia, for publication. I am currently writing the book that is based on the journey I took with my children on El Camino, the medieval pilgrimage route through Spain to Santiago de Compostela. I sure am glad I kept a journal on that trip! What a week! I say that with a big smile, mind you. I hope you’re having a terrific week and that all is well in your world. I’m learning a lot more about myself in regard to my Summer book launch of my historical fiction novel, A Decent Woman. Mostly, I’ve learned how I deal with new pressures, new information (mostly technical) and what I must do to control stress and pressure. I’m also growing thicker skin for the book launch.Yesterday, I read two author’s accounts of hateful reviews they received after their book launch and that has stuck in my mind. It happens. I follow Bambi’s mother’s advice – If you don’t have anything nice to say, say nothing at all. If you don’t like the book you’re reviewing or reading, for goodness sake, put it down and pick up another book! Now, I’m one tough cookie. My friends will tell you that about me. Like everyone on this planet, I’ve had my share of heartache, tragedy and loss. At one point in my life, my friends called me the female Job as in the Bible Job. What didn’t happen to me during a two year period. Well, I didn’t die which was great and my children were safe and healthy, but it was a very rough time in our lives. I wouldn’t say that I’m stoic, either. We’ve all had our moments and I’m not immune to a little crying jag every now and then and have leaned on the sturdy shoulders of good friends and family recently. I’m very fortunate to have a great support system! My intimate support group will rally with me when my book comes out. I know and love them well. And if one (hopefully, only one!) approaches me to say that they couldn’t get through my book, c’est la vie! To each his or her own. All authors need to hear the truth, BUT BE KIND. When you write a book and launch it into the world, you are introducing the world into your small world. Small in that writers are usually pretty solitary folks who spend thousands of hours alone in their head with their books and characters. With my book launch, the doors and windows will be flung wide open for reviews, critiques, and comments-positive and negative. I’m preparing myself and just pray that the positive outweighs the negative! If I do receive a nastygram, I hope it’s constructive criticism and on point. I’m okay with that. This is my debut novel and although I want my book to be perfect, that is impossible. I’ve written the best novel with what I’ve learned thus far and continue to learn to write better prose every day. All writers improve with more experience and practice, right? So today my emotions have run the gamut from happy to anxious to excited to self-doubt and back to happy. I have a gazillion things to do to prepare for my book launch of A DECENT WOMAN this summer and my list keeps growing. I’m not complaining, mind you. I realize that much of the promotion and marketing of a book falls on the author and Book Manager. And I’m fortunate to have a super Book Manager. Hey, if anyone points me in a new direction for marketing my book, I’m there. This morning, two friends sent me emails about online book clubs and I’m all over that, too. I am grateful for each and every piece information, advice, suggestion and ideas, people! Feel free to contact me 🙂 Any time. Make corrections and additions to my website which is under construction at this time. That first impression is vital and so is the second! Have a professional photograph taken for website, blog and media kit. Send out invites for the fantastic book launch party. Order enough books for my guests who attend the book launch party. Contact friends and family to join my book launch team as readers, reviewers and cheerleaders of the advance reader copy (ARC) of my novel. This is in bold because if you would like to be a part of my launch team, please contact me! I will be sending out email invitations and will post it on my Facebook Author Page, as well. I would love to have you! THANK YOU!! Continue doing my social media bit on Twitter, Facebook, Goodreads, ReadWave, LinkedIn, Pinterest and groups that I’m a member of. Learn what WATTPAD can do for me. Continue checking Part 1 of my novel for typos and mistakes and wait patiently for my editor to send Part 2 of her edits. Contact authors whose blurbs and reviews I would love to include on the book cover and in the book. I’ve already contacted four awesome authors who I respect and admire very much. Two more emails to write to two more awesome authors. If you are a praying person, please do 🙂 Thanks! The last item on my list was to create an official Author Page on Facebook. I figured it out last night and that was exciting! This morning, I had 65 beautiful LIKES. My smile was huge! This has helped keep me focused on my readers and my book at this dizzy, wonderful, and exciting time in my life. I’m taking Saturday and Sunday off from all book stuff to drive to Northern Virginia to spend the weekend with my beautiful children before my son departs for Europe on May 7. We are having a family dinner at a great restaurant in Arlington and I’ve promised not to cry…too.much. Press that nice LIKE button and make me happy! Thanks in advance! I wish you a wonderful Thursday. When I think back to the time before my book was accepted for publication, I realize that those days were easy peasy. While I certainly knew that preparing a book for publication and the marketing to follow would be time-consuming, I had no clue how much my life would change. At this time, two months before my debut historical novel, A Decent Woman, is launched into the world, life is a blur. I eat, drink and breathe this novel and my daily routine is unrecognizable. I wake up earlier, fall asleep much later and as soon as I am up and about, my brain is focused on my book and marketing on social media. Gone are the days when I puttered around my house and garden after a couple of hours of good writing and editing. Now during my writing breaks, I’m on Goodreads, LinkedIn, Twitter and my author page on Facebook and trying to think up new ways to reach readers of historical fiction, Caribbean literature, and women’s fiction. It is non-stop. I’ve sent emails to favorite authors whose book reviews and blurbs I would be honored to include in my book and on my book cover and the writing of acknowledgements to family, friends and new friends who have been instrumental in the writing and publication of A Decent Woman has begun. I wouldn’t be where I am today without their constant love, support and encouragement. The list is long and I count myself a very blessed person, indeed. I’ve learned a lot about myself during this process, mostly that I have the guts, nerves of steel (not always) and an insane amount of determination. I realize that although I knew very little about publishing and marketing a book when I started out, I’m learning and I’m a quick study. But, the most important thing I learned during the writing and marketing of my novel was to ask for help. Not easy for me! The life of a writer can be lonely and every time a family member and friend reached out to me, shared the excerpt of my book I posted on Facebook and came forward with help that even I didn’t know I needed, I again realized how fortunate I am. I am blessed to have such amazing people in my personal and author corner which at this time in my life, is one and the same. My daughter sent letters to every major television talk show host, introducing me and my novel to them. I had no idea she had done this and when I read what she wrote about me in her email, I cried buckets. Of course, I love her to pieces and was very touched by her words. In between studying for her Masters finals, planning her wedding and working her internship, she made the time to write this tender, touching and thoughtful letter. My daughter is a beautiful human being. How lucky I am. Amazing friends have walked my dogs, cleaned my kitchen, printed out copies of my manuscript, helped edit and fed me emotionally, spiritually and physically since February 14, 2014 when Booktrope contacted me about publishing my book. I am eternally in their debt. My Booktrope Team members and fellow authors have taught, inspired and nudged me to the next level and beyond. They have opened my eyes and pushed me outside of my comfort zone. No lie! I am blessed to work with such incredibly talented and professional men and women. It truly takes a village to publish and market a book! I hope I make them all proud. It is our pleasure to have writer/illustrator Jennifer Hotes, author of the YA suspense novel, Four Rubbings with us today. 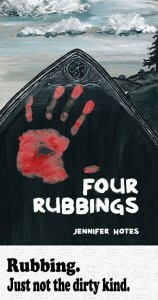 Four Rubbings is a crossover novel. It’s YA/mystery/suspense/thriller and has been picked up by a number of book clubs. Jennifer, please describe what the story/book is about. On Halloween night, when the barrier between the living and the dead is as thin as muslin, fourteen-year-old Josie, haunted by the death of her mother, leads her best friends through an old cemetery to make tombstone rubbings. Convinced she will come away with proof of her mother’s spirit at long last, the evening takes a very different turns. Four graves are rubbed that set off events that will shatter their mundane lives. As the teens struggle to resolve the mysteries left unfinished by the dead, they’re left wondering if the graves would’ve been better off left alone. There’s no creativity to it, (smile.) Four teens create four tombstone rubbings. Borne of a nightmare I had five years ago, the book was there in the images that clung to me when I woke up. I mentioned the dream to my sister-in-law, Stacy, and she encouraged me to write it down. As the years went on and I had to table the project for lack of time, my teen daughter, Ellie, told me to finish the book. She said, “Only you can write this story.” And I think that’s great advice for all writers, actually. Well, my favorite part is probably the thing that drives those around me most batty, but immersing into a fictional world – into the heads of my characters so completely that I lose myself. It’s tricky when I reemerge from the fiction world because often I carry the traits of the scene I’m working through. If it’s dark or tense, my husband will point upstairs where my art loft is and tell me to finish the chapter. I think that the attention it takes is along the lines of a newborn baby. You have to shut everything out to enter into this world. It’s a muscle that needs to be developed, and can be developed with consistent practice. Well, no surprise to you, I’m sure, but Stephen King. I ate him up as a young teen and on into my adulthood. I adore Kaye Gibbons and count her novel Ellen Foster as one of my favorite books of all time. Maya Angelou is another favorite author, and I’d lump her in with Anne Tyler because both of them have strong voices and wise words. I’m an illustrator by trade, so when I decided to write Four Rubbings, I needed to learn how to go about it. I read “Novel Writing for Dummies,” but that didn’t help. Then, my step-mom, Kate Erickson, recommended I read Stephen King’s On Writing. It is amazing. I found out that I’m not strange to refuse to outline, in fact, King thinks outlining is a cardinal sin. His approach is to create rich, layered characters, then set them into a situation. Your job as a writer is to watch them react and “journal” the results. That’s what I do. Thank you, Mr. King. My art loft. It sits above the front door to the house, has three floor-to-ceiling windows and no door. The no door part is aggravating at times, but it has been called the best space in the house by all my nieces and nephews. It’s full of color, crammed with art – some created by me – but mostly made by others. It’s a great writing space. My struggle is to balance social media with writing. It takes two very different sides of my personality to do each task. Social media means I need to be an extrovert – happy, cheerful, witty. And writing demands that I shut out the world, turn off the radio and dig internally for the characters, the world, the plot. So, that’s been my toughest challenge, learning to embrace my Jekyll and Hydeness and let one feed the other. I recognized that I’d gone as far as I could go with my book. I needed my editor to swoop in and slice at the words with a machete, demand more from me as a writer, and that’s just what Toddie Downs did. Well, be aware of your internal dialogue. Are you beating yourself up? Telling yourself that this isn’t worth doing? Become aware of that toxic thinking and then work to stop it. Replace the down talk with something shiny and positive. Sure, it’ll feel fake at first, but repeat it, and repeat it. Change your thinking and you can make anything a reality. People burned crosses in our lawn when I was a baby because my dad was trying to change the culture of a school district that had diversity but wasn’t yet embracing it. My father did amazing work, that resonates to this day in the district but at the time we were threatened and bullied. I’ve pitched a children’s book to an agent, so keep your fingers crossed. Also, pinch me, because I’m ghost writing a book for a Grammy-award winner. I am also hard at work on the second book in the stone witch series; Four Rubbings was book one, so it ends with a cliffhanger. Thank you, Jennifer! Good luck and happy writing! We are trying to spend as much time as we can with my son and of course, he is also trying to see as many friends as he can before he flies out. Time is short. This is what he wants and he was raised overseas, so I get it. I do. He will be happy there and my daughter and I pray for his safe travels and for a beautiful life for him. We are proud of him. He has carefully researched this move and I know this wasn’t an easy decision for him to make. I know all these things and still, my heart is heavy. I’ve run out of tissues and am down to using paper towels. My tears threaten to stream down my cheeks every few seconds and I’m trying to hold it together. At times, it doesn’t seem like I’m doing a great job and my dear friends are here for me, thank God. I’m not used to being such a baby, it feels alien to me, but I’m thankful for their care today and during these coming weeks. I’m reminded that my son is not going off to war, he’s happy, healthy and strong and I’m grateful for that. Very thankful. I just have to get a grip and stay there. Editing Part I of my historical novel, A DECENT WOMAN, hopefully for the last time, is keeping me distracted and grounded this morning. It’s been helpful to tackle my book edits in three parts. I’m making good headway with Part I and am happy with what I’ve written. I’ll soon be ready to tackle Part II and by the time I finish with those edits, my son will already be back in Europe. Which leaves Part III of the book- the end of the book which will signify his new life and beginning. It will also signify the launch of my book and my new beginning as a published author. Part III will not signify the end by no means. My historical novel will be launched into the world and with that will come much excitement, more hard work, marketing and hopes for good reviews and sales. I’m proud of this book. The book of my children that began the days they were born is a great book, too. It has been a pleasure to write this masterpiece with my children. It is a story of love, joy, adventure, trust, understanding and compassion. The book features celebrations, shared losses, many laughs, surprises and twists and turns as is life. I realize this morning that our book is in Part III-with adult children making their way out into the world without me. The family unit has grown and expanded and I will remain on the sidelines watching, cheering and loving them from a distance. As it should be. As with A DECENT WOMAN, there will be a sequel in the book of my children and probably, one after that. It is not the end of the world, although it feels like that this week. As a family, we will continue adding chapter after chapter until my children take over writing the book in their new voices and different perspectives. Actually, it just occurs to me that the book of my family that I began writing as a young wife and new mother will continue, but each of my children have already started new books of their own. Although we live close by and are very close, they’ve not lived with me for four years. It’s fitting that they’ve begun to write their own books and new chapters are being written with my son moving to Europe and my daughter graduating from her Masters program in December and her marriage next year. PLEASE JOIN ME FOR AUTHOR INTERVIEW FRIDAY on April 18! Our guest will be Jennifer Hotes, illustrator and Booktrope author of the exciting cross-over YA/suspense/mystery/thriller novel, FOUR RUBBINGS. We are excited to have Jennifer join us! Never open your story by describing a character looking out a window at the turbulent sea, watching the clouds, the rain or standing on a cliff overlooking the ocean. Over the years, I’ve read countless blog posts by authors and agents who say that this type of opening scene is the kiss of death for any writer. I’ve always thought it sounded romantic and moody, but I’ve also read that some agents admit to not looking beyond the first paragraph of a new manuscript if the story opens with a scene similar to what I’ve described. Hmmm. Well, I beg to differ. Not because I am feeling ornery this morning, I’m not. I just believe that some writing rules, when it helps your story and story line to break them, should be broken. BUT! Please, if you choose to describe your opening scene like this, for goodness sake…describe the window! So, let’s say the year is 1901 and you live in the seafaring coastal town of Barrio Playa de Ponce, on the outskirts of the colonial city of Ponce, Puerto Rico. You survived the United States military invasion of your homeland and miraculously, you survived the longest and most devastating hurricane in recent history-Hurricane San Ciriaco that claimed the lives of 3,400 men, women and children across the West Indies. Early one evening, you hear the distant rumble of thunder, the winds pick up and rain begins pinging off your tin roof. I’m guessing that you and every member of your family run to the nearest window in five seconds flat. I know I would. I’d be checking the skies, the clouds, the mood of the rain and wind. I would check the horizon for any sign of more military vessels. I would also recheck my house, specifically, the roof, to make sure I am ready for whatever may be brewing out to sea. Just in case. My historical novel, A DECENT WOMEN, opens at the beginning of a tropical storm. This opening is very natural to me. I was born on the island of Puerto Rico and I’ve experienced many tropical storms. Hurricanes, tropical storms, tempests, cyclones and storms are a way of life on the islands. Hurricane season, from June to November, is a genuine threat and taken into consideration when planning weddings, anniversary or birthday celebrations but then again, you can’t stop living. I never consider scheduling my flights to Puerto Rico and the islands only in the spring or winter months, so that I am certain to miss a hurricane. If I have the opportunity to travel, I go ahead with my plans. Since I wrote the first outline for A DECENT WOMAN, I visualized my novel opening this way. Because life can be random, at times chaotic and unpredictable, I chose for a child to be born during a lesser storm and have a midwife standing sentry. Not unusual and not rare. The midwife is my protagonist, Ana Belén and the child, Serafina Martínez, grows up to be Ana’s loyal, trusted and beloved comadre. They are trapped inside a small wood house at the edge of the Caribbean Sea, but life goes on in the islands despite the weather and what Mother Nature has planned. I continue with the forces of nature throughout my novel. There is an earthquake in the middle of the story, the highest part of the story arc, because it is historically accurate . At this point in the story, everything seems lost. It is a fitting climax and right after, the rebuilding begins for the city and my characters. A cool aguacero, a passing rain shower, closes my story with healing and cleansing in the mountains of Yayuya. Mother Nature is an important character in my story and if I’m honest, she is the main protagonist of A DECENT WOMAN. The weather can set the mood of your story and can be the harbinger of things to come. It is the musical accompaniment to your scene or chapter. Symbolically, the comparisons between nature and life seem endless to me. Go for it.